One of my absolute favorites on any appetizer menu it seems almost too good to be true that a lightened up version of this cheesy dip exists! 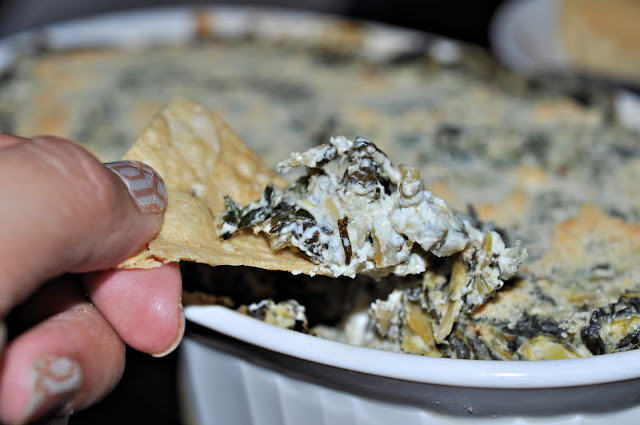 Made with Chobani and enjoyed with Cabo Chips this Skinny Artichoke Spinach Dip will have your party guests in bamboozled into thinking they're nomming on the real thing! So a while back Chobani sent me a box full o' CHO goodness to use in some recipe testing. I used some of it in my Green Monster Smoothie Popsicles but I was hoping to be able to use it in something savory as well. During my recipe hunt I was contacted by Cabo Chips to collaborate and come up with a recipe that would pair well with their chips. 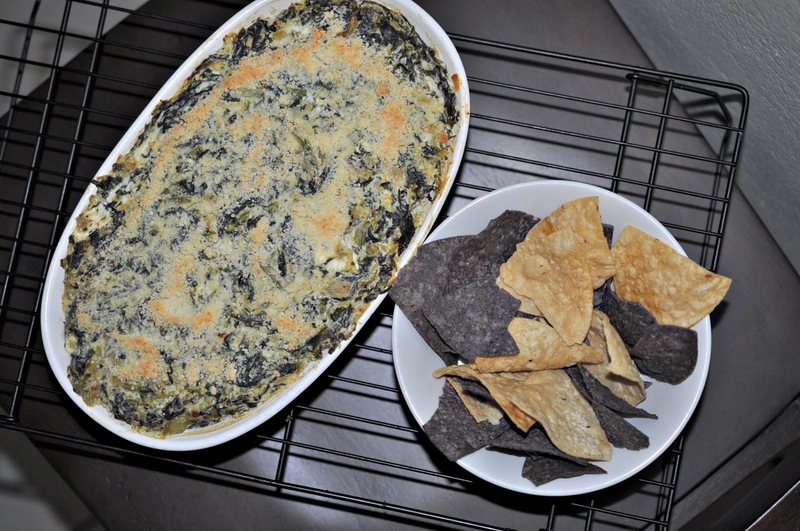 Tortilla chips and artichoke spinach dip? It's a match made in appetizer heaven! 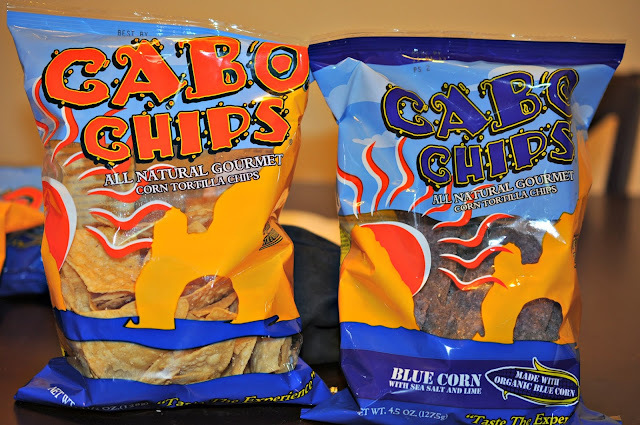 Cabo Chips are unique in that they are non GMO, gluten-free, and all natural! The Blue Corn Cabo Chips are even made with organic blue corn! The chips are hand cooked in soybean oil in small batches to ensure that the chips are light and crispy without being over greasy. My favorite part about these chips, other than the fact that they're incredibly delicious, is that Cabo Chips uses all natural ingredients. No flavorings, preservatives, trans fats or any of those "how the heck do I even pronounce that" stuff. Oh, and they're super easy to find! Check out your nearest Sprouts, Ralphs, or Whole Foods to pick up a bag for yourself! Even though these chips are light and crispy they are extremely durable when it comes to dips. 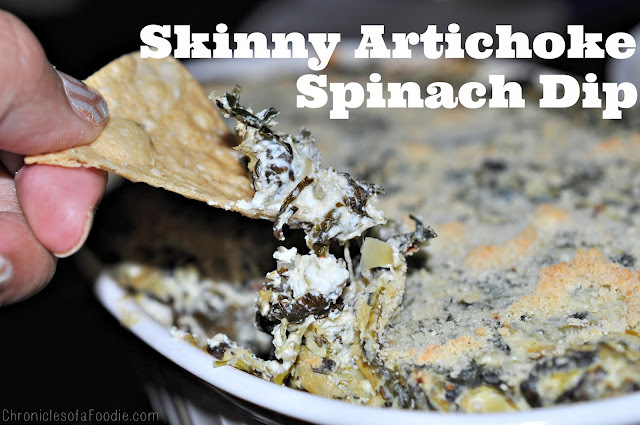 This Skinny Artichoke Spinach Dip was pretty thick but the Cabo Chips held up well when packed up with the dip...and I was not shy with the dip. Because I was using tortilla chips that were already seasoned (aka salted) I didn't add salt to my recipe. In doing this I avoid over-salting the dip and messing up the natural balance between the tortilla chip and dip. Sure, most skinny dips tend to not taste like the real thing. I'll be honest, in my dieting adventures (yes, even foodies watch the scales!) I've had some pretty terrible things. But I promise, this dip totally delivers. By making some simple swaps you're still able to enjoy the food you love in a way you never thought possible! Alright, back to the recipe! The simple swaps in this recipe are Chobani plain yogurt and lowfat cream cheese. The average spinach artichoke dip uses mayonnaise, sour cream and/or whole milk. By using greek yogurt and light cream cheese you're still able to achieve that creaminess without sacrificing any flavor. Also, you're dramatically cutting the fat and calories of a usually heavy dish. In a medium frying pan heat olive oil and add garlic. Cook until fragrant, about 2 minutes. 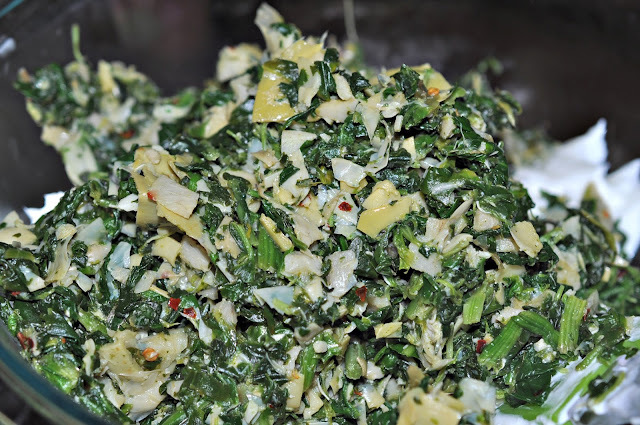 Add spinach and artichokes to pan. Cook for 2-3 minutes. Add red pepper flakes. Remove pan from heat. In a large bowl combine yogurt, cream cheese and 1/8 cup parmesan cheese. Add cooked ingredients to bowl and combine all ingredients together until well mixed. Transfer mixture to oven safe baking dish. Sprinkle remaining 1/8 cup of parmesan cheese on top. Bake for 30-35 minutes. Let cool for 5 minutes. Best served hot with Cabo Chips or your favorite tortilla chips. Speaking of lightened up recipes, our friend Kasey over at Kasey's Kitchen is inspiring fellow food bloggers, as well as ourselves to be more active and make some simple swaps so we can continue to enjoy the foods we love while also promoting a more healthy lifestyle in the process! We don't use the word diet here...that word immediately makes you think you're giving up something, where what we're doing is taking ON something: Taking on some extra activities. Taking on the challenge of cooking for yourself vs. eating out throughout the week. It's a challenge Kasey has dubbed: Foodies Shedding Booties! Cute name right? Well we're definitely into it and we'll be trying to create some more lightened up recipes on the blog as part of the challenge! 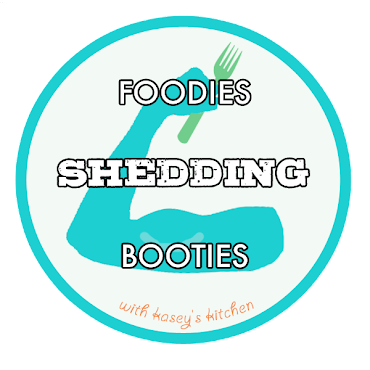 Keep an eye out for the "Foodies Shedding Booties" badge on our next skinny recipe post! Hello, I am hopping from SITS. This looks gret and I cannot wait to try. Thank you so much for sharing this. I used to make a spinach-artichoke dip all the time.. I will definitely have to try this!